As the calendar turns to May the inevitable always happens, people start asking how many days are left of school. Just this past week three different parents asked me. It is not that they mean any harm. They are just making conversation and let's face it, the school day countdown has been a part of our culture for a long time. But here is the thing about how many days are left in the school year, I genuinely do not know. The parents seemed surprised but I tell them, I don't countdown the days until the end of the year. Before you say this is coming from a grumpy old administrator, I didn't do countdowns as a teacher (well after my first year) either. Don't get me wrong, I love summer. Summer means I get to spend more time with my kids, family, read more books, go on more bike rides, go on a few trips. I love summer, but I also love my job and love that we get to make a difference. It also doesn't mean that I don't plan out what I have left to do for the rest of the year. I know there are only so many more days for professional development, days to meet with teachers, days to get into classrooms. There are only so many days left to get things done for this school year so I still plan. Obviously not every teacher, parent or principal that has used a countdown has used it in a negative way but some definitely have. At the first school I taught, I saw teachers counting down like they couldn't wait to never see their students again. And students can feel it. Sure some of them can't wait for school to be out but some need the structure of school. For some students, school is the best thing they have going. And for other students they just love learning and why would they want to see something they love end? Counting down can come across that you aren't making the most of everyday and that you can't wait to see your students leave. 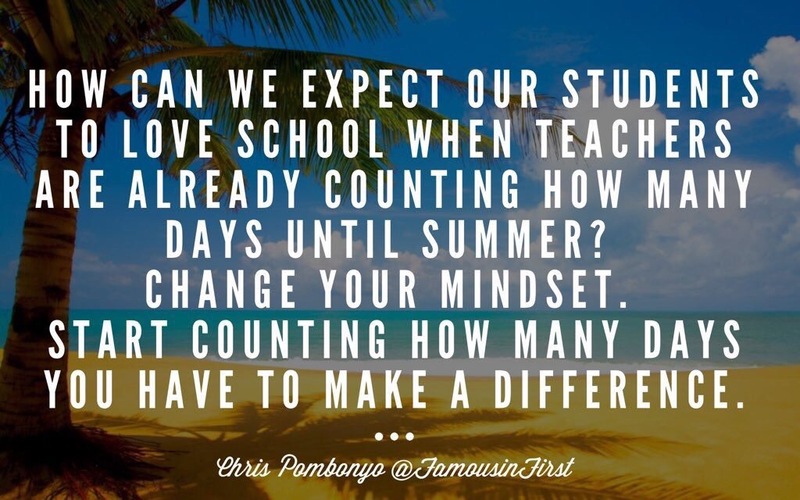 Great quote from Chris Pombonyo, first grade teacher in Florida. We only get so many days with our students. Our students deserve our best every single day. It doesn't matter if it is day 1 or day 179 of the school year. They deserve our full effort and attention. Let's say we don't give it our all for just the last 5 days of school. That is hardly anything right? Well if every year a student has that in their TK-12 education that is 70 days of learning that they will be missing out on. Each day we get to influence and teach our students. While counting down doesn't mean you aren't giving your all, it comes across that you are just waiting out the rest of the year. My first year teaching I counted down days just like everyone else. I realized the more I acted like the year was almost over the students' behavior got worse. So my second year and every year after that I told my students we will learn until the last day of school. The more I emphasized that learning never ends and that we keep learning, the more students would work and their behavior would be more like it was in October than like 8th graders that were a few days away from never seeing middle school again. The end of the school year is a perfect time as a teacher to try new things. You might find something you love and want to start from day 1 next year. Teachers need a break and teaching can be exhausting. But signs like this one I just saw last week in a local store gives teachers a bad name. 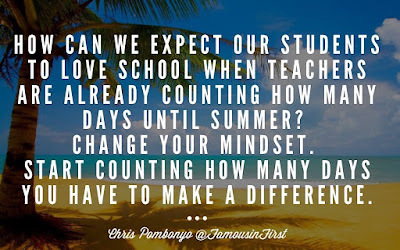 If you feel you need to countdown you can countdown how many days you have left in a fun way like Principal Melissa Kartsimas describes in her blog ABC Countdown or countdown how many days you have left to make a difference like my friend Todd Schmidt says in his blog post How Many Days Left to Make a Difference. For me though I won't be counting down. I am unfortunately all too aware that the number of days we have left to enjoy this school year and make a difference are getting lower. My own children go to my school, and everyday that passes is one less day I get to be their principal. Luckily I still have a few more years with them. But for the rest of this school year and every school year after this one I won't be counting down days. I am too busy having fun and enjoying what I do to countdown the days. I really love that Quote of Legend Muhammad Ali.Don't count the days,make the days count.What an awesome taste in his quotes.Thank you very much for sharing.Keep posting.